MANILA, Philippines (CNS) — Some Muslims in the Philippines hope Pope Francis will publicly show support for a peace pact between the country’s largest Muslim rebel group and the government during his Jan. 15-19 visit. Other Filipino Muslims have said they simply respect the pontiff and see him as a fellow-believer in God. 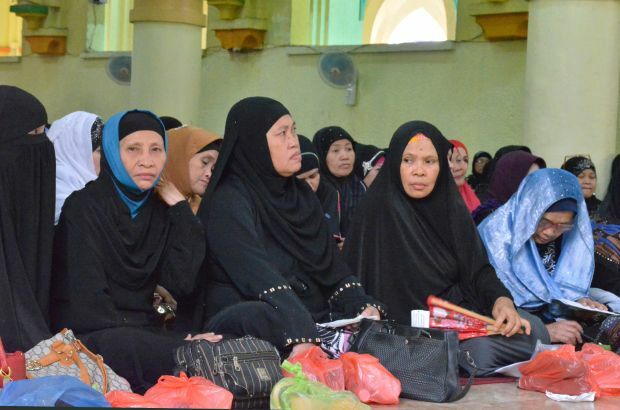 At Manila’s largest mosque in a predominantly Muslim neighborhood, scores of women, mostly in black burqas, recently attended a seminar on how to attain paradise. In a partitioned section of the long prayer room bearing a gold-colored dome, a few women talked to Catholic News Service about the pope’s pending visit. “We respect (the Catholic) faith and for us, our belief is that he’s just a normal person,” said a woman who identified herself only as Farhana, who has lived in Manila almost all her life. CNS talked to a sampling of Muslims around the Philippines. Those in Manila were more or less neutral on the pope, while those in the South welcomed his coming as something that could boost efforts to form lasting peace in their region. With the peace agreement signed, government and Moro Islamic Liberation Front officials have focused on getting a measure passed that would form an autonomous region in the southern islands of Mindanao; it would be called Bangsamoro. Mohagher Iqbal, the Islamic front’s chief negotiator, has said the pontiff’s peace and reconciliation stance could be a “morale booster” for their cause. During the time of Spanish colonization of the Philippines, the predominantly Catholic government pitted Christians against Muslims in the South. The fight evolved into a conflict between Muslim rebels and government forces that, in the last four decades, left more than 120,000 dead and millions displaced. After nearly 20 years of on-and-off negotiations, with some failed attempts ending in fighting, both sides formed a peace pact that they signed last March. Iqbal said the rebel group’s chairman wrote a letter to the pope expressing the oneness of the Islamic Front with the upcoming visit and urging him to say something publicly about the peace agreement. Lidasan similarly said it would be a “big help” if, during his visit, Pope Francis could express publicly the importance of passing the law that would form the Bangsamoro region. “And he’s really the guy who shows that, who symbolizes that,” he added.